Painting Alberta PINK for Hair Massacure! From the Edmonton Eskimos to the Calgary Roughnecks, pink hair and poodles can only mean one thing: Hair Massacure 2016! Throughout February, our Hairstyling and Esthetics Squad at the Calgary and Edmonton campus “Pinked” hair and nails, and shaved heads as part of Hair Massacure’s official events. What’s “pinking” you ask? It’s getting your hair or beard coloured/lightened pink to raise awareness and funds for charities such as: Make-A-Wish Foundation, Stollery Children’s Hospital Foundation and Ronald McDonald House Charities Southern Alberta. The official pinking event took place at our Edmonton and Calgary campus. From Freddy the poodle (don’t worry it’s just beet juice) and ShawTV to our very own staff, it was all hands on deck when it came to showing support for Hair Massacure. Dozens of people came through our doors to have their hair (and beards!) coloured pink. Did you catch us LIVE on ShawTV Calgary and Edmonton, and Global TV Edmonton? 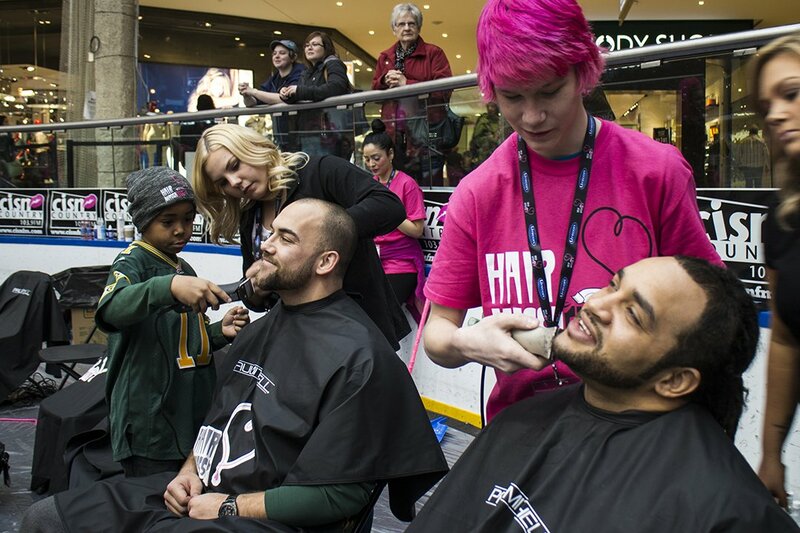 On February 24th and 28th, #BaldIsBeautiful and #NoHairDontCare was trending in Edmonton and Calgary during the Hair Massacure Shave Off Event! The event took place at the Ice Palace at West Edmonton Mall and at the Calgary Roughnecks game. From children as young as five years old to cancer Survivors and the Edmonton Eskimos, hundreds of people shaved off their pink hair. MC College students were on hand to assist with shaving heads and doing pink manicures.